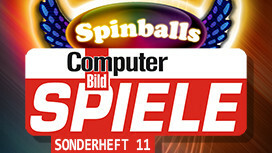 We are more than pleased to announce that the current issue of ComputerBild SPIELE special edition 11, available from 02/25/2017 to 05/24/2017 in germany and austria, contains the full version of Spinballs Special Edition for Android. Have a lot of fun with it! Get the latest on our upcoming games, updates and more!